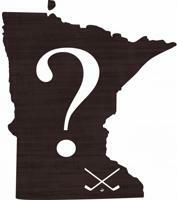 While conducting research of Minnesota's Hockey history across the State of Minnesota, there is a lot of questions that arise seemingly on a weekly basis as to; "What happened to this"? "Where did that go to"? "What became of that"? "Can we get this"? and so on. We receive a good share of e-mails and questions via social media that we seem to answer the same question over and over again - "No one knows". We thought we'd compile this page of Minnesota's Hockey Mysteries and Unknowns in hope that the below questions will someday be answered. The single biggest question that we receive - typically each and every year around the State Tournament - "What happened to all the older footage from the Boys State High School Hockey Tournament". Great question, that has been researched to no end. The Minnesota Historical Society, Minnesota State High School League, US Hockey Hall of Fame, WCCO, KSTP, MSC, Prep 45, etc all DO NOT have older footage either as this avenue has been explored several times, with no luck. Why? Simple - This was pre VCR to record anything on TV, and if the original tape reels are out there, no one knows of them! The University of Minnesota Gophers STARTED to broadcast televised games in the late 1960's from 1969 and up (Thus why they too added names on the backs of their game uniforms in 1969 for TV). The Boys Tournament started in 1945, and even though television cameras can be seen within older black and white images, and small clips can be seen on such broadcasts like the FSN - State Tournament Ice Dreams program, the oldest game that we know of is that from the 1963 Minnesota High School State Tournament. Since 2010, all games can be purchased on DVD at GrandStadiumTV, whom is a partner of Prep 45 TV. We truly hope that we are wrong and somewhere out there these lost treasures are sitting in a box, or some unknown archives. Just as one fan e-mail we received stated: "We need to find these games, this is the fabric of whom we are, our communities, and schools. Our Grandfathers & Dads all played in these Tournament games and they need to be found and preserved". 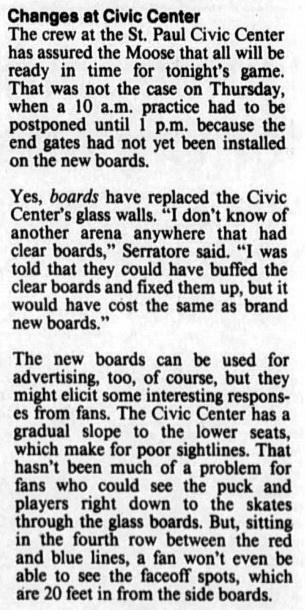 We have OFTEN posted the question on social media: "Where did the clear boards within the Civic Center go to"? with lots of replies of: "Yeah great question, where did they go"? The clear boards and dashers at the St. Paul Civic Center and also, early on within the St. Paul Auditorium had very unique clear boards that lots of State Tournament fans remember vividly from the old Civic Center. We personally have conducted quite a bit of research on this very question - "Where did they go to"? The answer is, they were removed October 6, 1994 before the Minnesota Moose first season in the IHL, x1 day before the teams first game (October 7, 1994) that called the Civic Center home, after the team cried fowl that they needed standard dasher boards to sell advertising which today is a lucrative business for NHL, Collegiate and youth arenas across the country alike. We have spoken to several people from the Minnesota Wild, and several individuals whom worked at the Civic Center, that now are employed at the Xcel Energy Center and Roy Wilkins Auditorium that were in the same location as the Civic Center and St. Paul Auditorium respectively. All "these people" remember is they were auctioned off on some early internet message board, and we helped load them into a semi trailer". Semi trailer destined for where? Whom purchased them? Roger Godin stated that he was told - after he too looked into this and original receipts from a Bill of Sale - that "they were shipped somewhere to an arena in Canada" where presumably were installed and could be in some little barn in Canada today? If someone reads this, and knows of their whereabouts - we'd like to solve this mystery which should be farely easy to solve considering the boards were removed just before the 1994 Minnesota Moose season. The Metropolitan Sports Center was the former home of the Minnesota North Stars in Bloomington, MN from 1967-1993 before the team relocated to Dallas Texas to become the Dallas Stars. 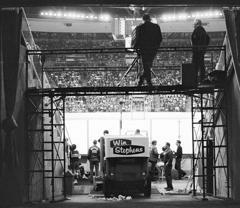 Met Center was known by many NHL players to have some of the "best ice in the NHL" seemingly because of the frigid exterior temperatures in Minnesota. 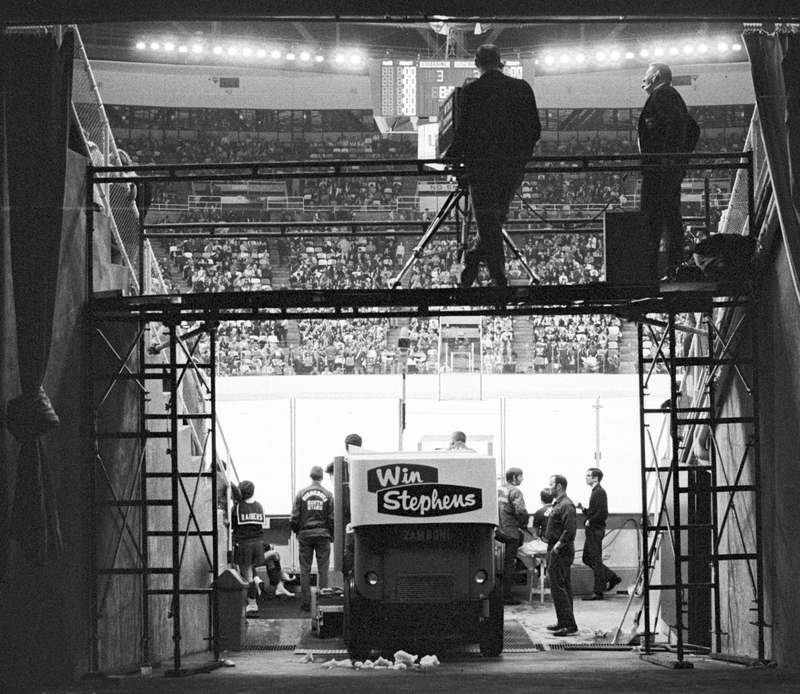 Fans remember the excellent atmosphere, great sight-lines, rowdy Blackhawks vs. North Stars games, Dino the Dinosaur, Electric Stars Girls, and the unique colored seats within Met Center among a sea of kelly green, gold, black and white seats. The Met Center was sadly demolished in 1994 following the departure and we had the opportunity to "pick" Met Center before it was torn-down and have a treasure trove of interior signage, original seats, and other arena artifacts today in our personal collection. The seats we have have the nicely adorned dark red-burgundy fabric on them and a lot of people that see them say "Those were in the Met Center? I thought they were colored seats"? When Norm Green instituted his Stars - Working Harder Than Ever advertising campaign, this also included several renovations to Met Center in which ALL of the Met's iconic colored seats were re-upholstered. This can be seen on our Met Center Arena page with the video walk-through. The ONLY chairs that remained to have the original colors were that of the portable chairs that were utilized in the concourse, for concerts within Met Center, and in the handicap sections for easy put-up and take-down. These colored chairs today are actually the seats within the 1994 erected Sleepy Eye Ice Arena, in which they were given the seats for free to be used in the arenas general seating area. 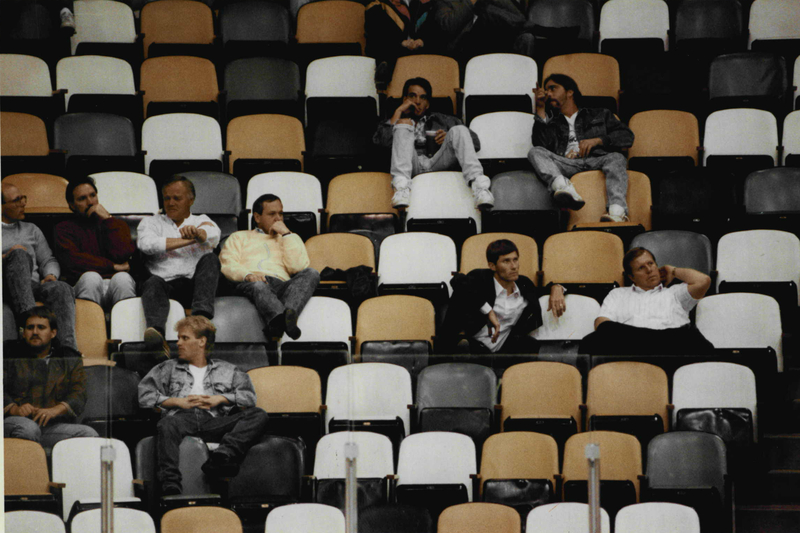 When looking at the chairs within Sleepy Eye Arena one can easily notice the multiple cigarette burn holes in a few of the chair coverings as a sign-of-the-times that smoking was once allowed within Met Center. 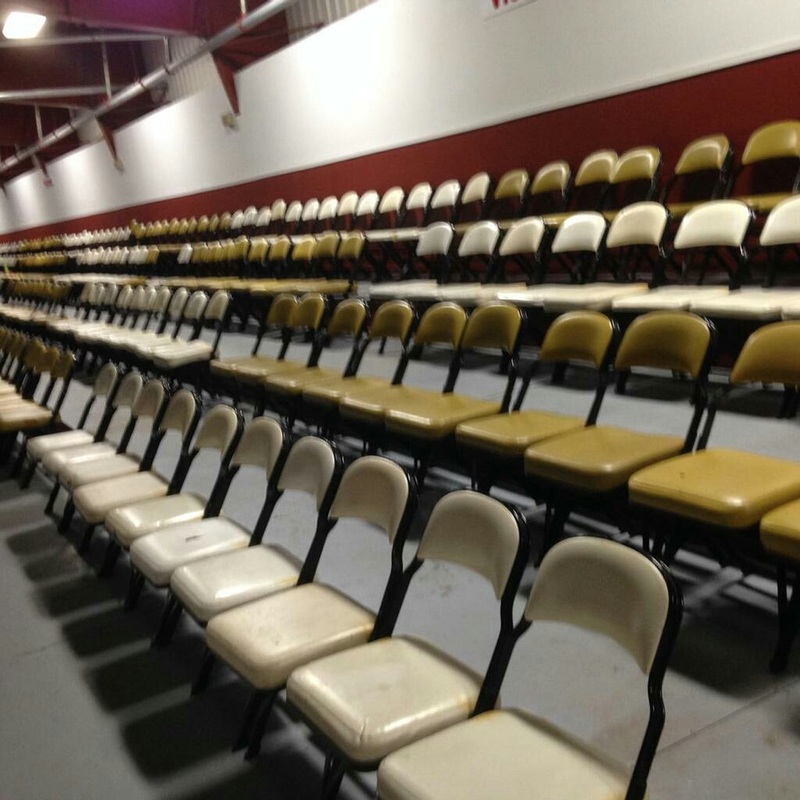 Ironically, the local Sleepy Eye Elementary School a few miles away from the Arena, has their entire school auditorium filled with the original dark red-burgundy arena seats today that were also salvaged by the towns residents before Met Center was demolished. Just as we have already discussed on our Minnesota North Stars Jersey Evolution page, we have a page covering the 1967 Minnesota North Stars pre-season history and jersey(s) which covers how vastly different from the actual North Stars logo that was eventually used for the remainder of the inaugural Minnesota North Stars season. We personally feel the fans, team owners and/or graphic designer - George Karn of St. Paul, MN - whom created the iconic North Stars N-logo didn't like the "crooked N" and had it straightened. For whatever reason, it makes this a mystery, and probably one that will never be answered since George Karn passed away in year 2000, and Walter Bush when interviewed by VMH prior to his passing "didn't recall" as to why the logo was altered. 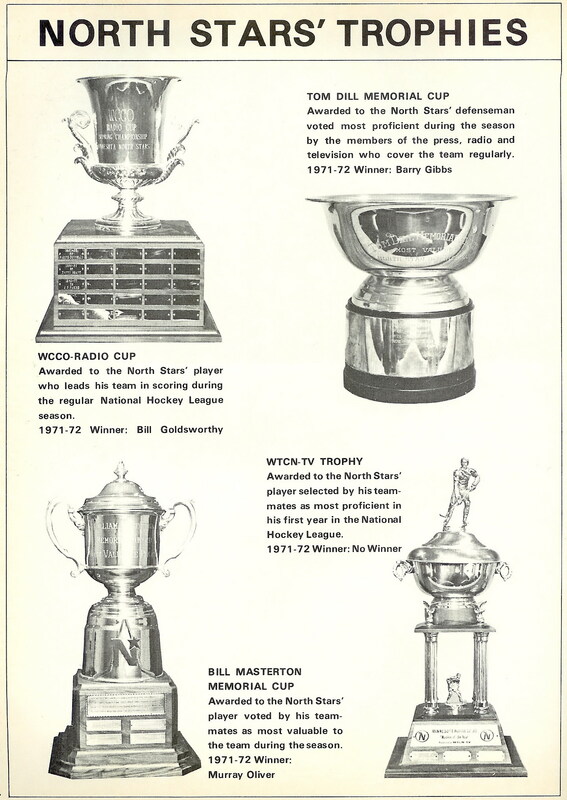 The Minnesota North Stars, like many teams, had and have individual trophies that were presented at season ending annual team gatherings and banquets awarded to various players. What happened to these shown trophies is a mystery? Did the final players that these were awarded to have them in their homes today on display? Did they make the trek down south to Dallas TX with the Dallas Stars? No one seems to know, thus this question will remain a mystery until answered.